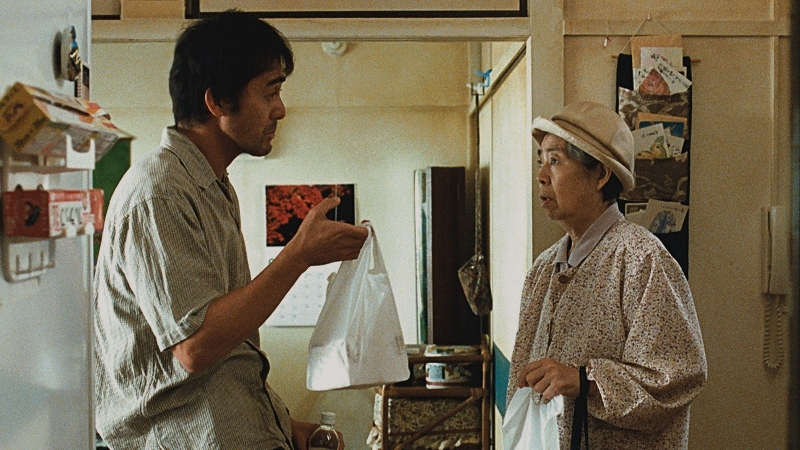 Immediately calling to mind the work of earlier masters like Hou Hsiao-hsien and Yasujiro Ozu, the films of Japanese director Hirokazu Kore-eda are often small in scope, with a limited cast and only a handful of settings. Much like his earlier work including Nobody Knows, Still Walking, and Like Father, Like Son, his recent film After the Storm (2017) follows a small, fractured family during an extremely short window in their lives. It's largely told from the perspective of novelist and part-time detective Ryota (Hiroshi Abe), whose best years as a writer are seemingly behind him. Ryota's personal life also appears to be something of a wreck: his messy apartment and mounting personal debt are bad enough...but not as bad as the inability to pay child support to ex-wife Kyoko (Yoko Maki) for their son Shingo (Taiyo Yoshizawa), who lives in her custody. His only support is aging mother Yoshiko (Kirin Kiki), who has lived alone since her husband's death, and dutifully gives Ryoto money and food at a moment's notice. Despite his increasingly bad habits---which include petty theft, gambling, and emotional manipulation---Ryoto is obviously trying to get his life back on track, and we're able to root for the guy more often than not because of Hiroshi Abe's effortless charisma. His most recent "scheme", which serves as the bulk of After the Storm's plot, is to reunite with Kyoko and Shingo at his mother's house as a typhoon approaches: with any luck, it'll keep them all inside together for at least one night. 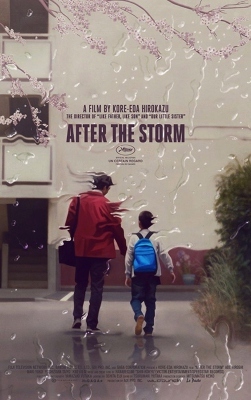 Shot on location at the housing complex where Hirokazu Kore-eda lived from childhood into his late 20s, After the Storm was obviously an intensely personal project for the director. Conceived in early 2001 during a visit with his own mother (who, incidentally, was living alone at said complex after her husband's recent death), much of After the Storm's narrative, atmosphere, and characters feel so natural that viewers are easily able to forget they're watching cast members in a film. As a result, we get to know everyone extremely well in relatively short order: these are simply great characters played extraordinarily well, with no strings attached. Overall, it's the kind of measured, mature result you'd expect from a celebrated director who's almost three decades into a career that will likely be filled with more success. 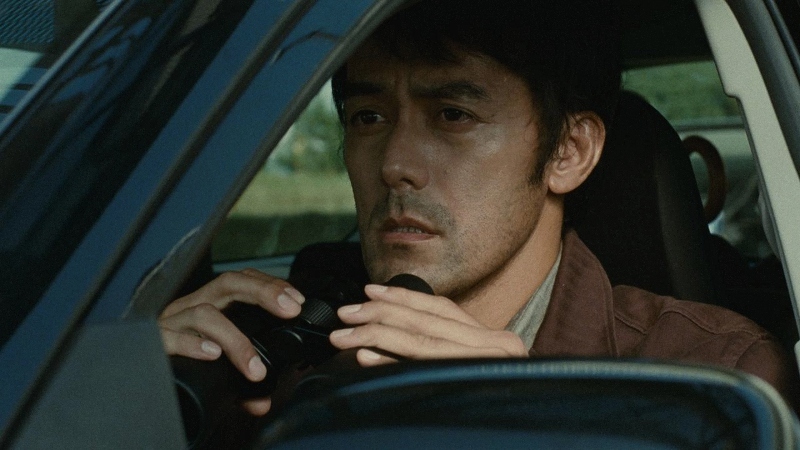 Presented on Blu-ray by Film Movement, After the Storm should appeal to lovers of foreign drama, and its leisurely pace make it an accessible entry point for those usually scared off by subtitles. The main feature is paired with an A/V presentation that certainly has its share of positives and negatives (see below), but the included bonus features give it a great deal of added value. Overall, this is a solid package for established fans and curious newcomers alike. Not surprisingly, this slice-of-life drama doesn't exactly aim high in the visual department, but I'm not sure if the problems with its 1080p Blu-ray transfer are from source material issues, oversights, or needless tinkering. First, the positives: After the Storm offers a largely smooth and pleasing image with even, natural colors and a good amount of detail in close-ups. Yet black levels, shadow detail, and gamma levels seem out of whack at times, as there's very little true black---it's often more like medium-gray, to be honest---and large chunks of darker patches are as flat as a pancake. Though After the Storm was shot on 35mm film, it's also obvious that a certain amount of digital noise reduction has been applied as well. This isn't an ugly image by any stretch, but peculiar enough to feel like something's wrong (especially in light of my similar problems with Film Movement's Blu-ray of The Quiet Earth released earlier this year). The original Japanese 5.1 mix is offered in either Dolby Digital (the default, for whatever reason) or lossless DTS-HD Master Audio. Neither choice is disappointing: as with the visuals, After the Storm aims for a natural atmosphere free from gimmicks and not overloaded with big music cues. Dialogue is clean and crisp, with occasional moments of surround activity and separation that draw the viewer in subtly. Optional English and French subtitles are included during the film and bonus features, which also translate some of the signage and background details for added context. The beautiful cover replicates one of After the Storm's original poster designs (a hand-drawn image, believe it or not, by illustrator Akiko Stehrenberger - seen below right), with interior artwork featuring notes about why it was selected for Film Movement's collection. The clear keepcase looks great too, and gives this a much nicer feel than those cheap eco-friendly blue cases. A promotional insert advertises other Blu-rays from the studio, as well as a handful of forced trailers before the main menu can be accessed. It's a tasteful package overall, aside from all those commercials. The main attraction (and a Blu-ray exclusive, according to the packaging) is a 73-minute Behind-the-Scenes Documentary that goes into great detail about the film's inception, casting, and production. Featuring director Hirokazu Kore-eda, assistant directors, and other crew (as well cast members including Hiroshi Abe, Yoko Make, Kirin Kiki, and Taiyo Yoshizawa, who also narrates), it's an extremely insightful piece and shows just how personal this story was for the director. Other topics include pre-production in 2014, the first scene he wrote, shooting in the housing complex he grew up in, hunting for other locations, speaking with a few old friends and neighbors, his previous work, collaborating with the cast and crew on story elements, designing and choosing the props, using 35mm film stock instead of digital cameras, obsessively decorating the interior sets, the shooting process, lessons learned during production, and much, much more. It's a well-done documentary and, at times, really makes you feel like part of the process. Also here is After the Storm's Theatrical Trailer (2 minutes) and unrelated short film The Last Dream, directed by Carmen Kobayashi and Noemie Nakai (also presented in Japanese with optional subtitles). Though much different thematically and overall atmosphere, this heady 2017 short is well worth a look for anyone who enjoyed the main feature. 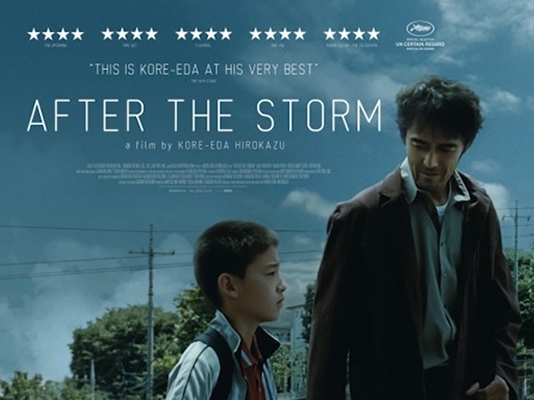 Layered but extremely subtle at times, Hirokazu Kore-eda's After the Storm is an affecting personal drama that reunites key members of the cast and crew from his 2008 film Still Walking. I feel it's a more successful effort for several reasons, as the director absolutely poured much of his earlier life into it; this one had been brewing in the back of his mind for over 15 years, and I'm glad he didn't rush to get it out. Featuring a handful of extremely natural and charismatic performances, excellent cinematography, and a leisurely pace that lets the story unfold naturally, it's the kind of film that lingers in your mind for several days afterward. Aside from a few mild to moderate issues with Film Movement's Blu-ray transfer, theirs is an outstanding package with lossless audio and a few worthwhile bonus features (including a detailed and lengthy behind-the-scenes documentary). It's firmly Recommended for curious and established fans alike.